As many of you may know, I was just in Costa Rica leading two back to back property tours. I just returned on the 14th of January and am now catching up on my blogging. We spent Thanksgiving this year with friends from Key West. There were 8 of us all together. We had a crab stuffed Mutton Snapper as our main course and we also had a Turkey. Kristina insisted I buy a "Happy Turkey" one that lived it's life as a vegetarian and free ranged. Happy Turkeys (read expensive Turkey) aren't sold as loss leaders at Publix, Winn Dixie or Stop and Shop. They come from Specialty stores and typically cost as much as a Day at Disneyworld. They don't seem to taste different to me and since Kristina is a vegetarian, I suppose they don't taste different to her. I don't really think the Turkey was any happier once he was in the oven but who knows. 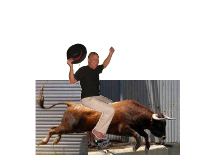 Bullfighting in Costa Rica - Or should I say Bull Riding?